Gerard (Gerrit) van Honthorst (1590�1656), Adoration of the Children (1620), Uffizi Gallery, Florence. Italy. Larger image. Joseph was in intense pain. His fianc�e Mary was pregnant, but not by him. What could he do now? How could their proposed marriage ever work now? But how could he let her go? As he slept fitfully, and angel came to him in a dream to assure him, "What is conceived in her is from the Holy Spirit. "1 He believed the angel, took Mary to be his wife, and the rest is history. 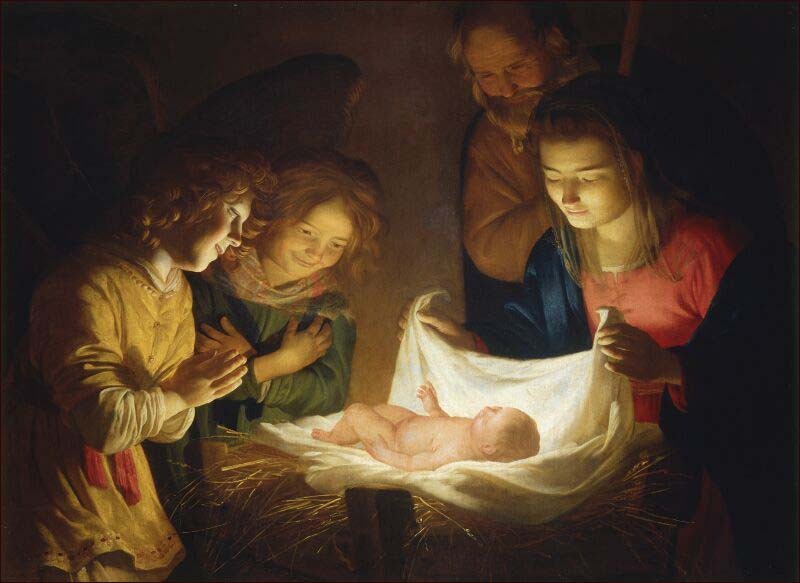 I'm sure the townspeople believed Joseph was the child's father. To discredit him, a story circulated that he was the illegitimate son of a Roman soldier. A prophetic sign given some 700 years before has a meaning beyond its own time. But what is its significance? What does it tell us about Jesus' person and life mission? What does it mean to you? Two things, I believe. Do you know what it feels like to feel utterly alone? To try to attempt to live your life with no one to fall back on, no safety net, no help? If you've been through some desperate times in your life, then you know exactly what this feels like. The wonderful promise made through the Christ-child Immanuel is that God promises to be with you in your troubles. He will not leave you to your own resources. All of his resources are now available to you. The difference for you can be like night and day. In past times God had made this kind of promise to special people in history. The title Immanuel tells us about the mission of Jesus, it also tells us about his nature. Remember the context? We have just been told about Mary's pregnancy, Joseph's concern, and the angel's assurance ("What is conceived in her is from the Holy Spirit"). At that point the narrator tells us that this fulfills Isaiah's prophecy, "'The virgin will be with child and will give birth to a son, and they will call him Immanuel' — which means, 'God with us.'" Matthew's account of Mary's conception tells the story from Joseph's point of view. Luke's account focuses on Mary's experience. The angel Gabriel has told Mary that she will bear a son who will be the Messiah. "'How will this be,' Mary asked the angel, 'since I am a virgin? In other words, Immanuel, "God with us," is to be understood literally. Jesus is physical son of Mary in his human nature, but spiritually, he is the Son of God, he has been begotten by God himself. So when the shepherds and wise men gather and worship the Baby, they are worshipping God himself. Jesus the Son is divine to the same degree that the Father is divine. That is the very radical meaning of Christmas. It isn't about mistletoe and music, or parties and presents, or even the spirit of giving. Christmas is a celebration of the radical fact that God took on human flesh when Jesus was born. Jesus — God Himself — is Immanuel, God With Us! Gerard Van Groningen, TWOT #1640b, d; Joseph Jensen, "Immanuel," ABD 3:392-395.